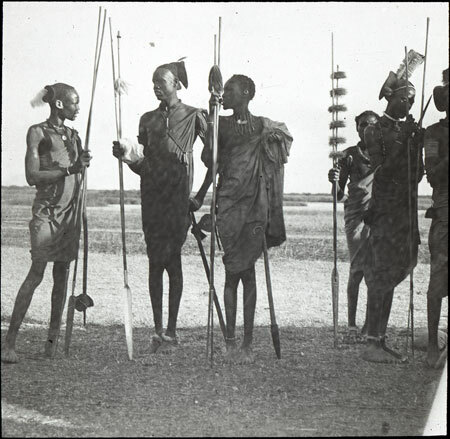 A group of Shilluk youths near a river or lagoon, with hair styling and ornaments, probably more representative of fashions in 1922 than 1910, the dates of two separate visits to Shilluk country by the Seligmans. Manual catalogue entry (thermofax catalogue copy in folder '27-06 Seligman Slide Collection') - "V.h.35. Nilotic types"
Note on lantern slide ms ink - "V.h.35. Nilotic types. CGS. 325"
Morton, Chris. "Portrait of Shilluk youths" Southern Sudan Project (in development). 03 Jan. 2006. Pitt Rivers Museum. <http://southernsudan.prm.ox.ac.uk/details/1967.26.298/>.